Every Memorial Day weekend since 2000, the world’s best junior golfers gather at Grayhawk to compete in the Thunderbird International Junior featuring 78 boys and girls from across the world ages 12-19 representing 17 states and 16 countries. This year, local Ashley Menne will be the “lone ranger” from Arizona to play in the tournament considered to be one of the most competitive in junior golf. Menne enters the field with 12 American Junior Golf Association (AJGA) events under her belt. To date she is in 19th place in the Rolex AJGA Rankings with one win at the ACDS/Ryan Moore Junior at Oakbrook in July ‘17. (Coincidentally, Ryan Moore won the Thunderbird International Junior in 2001.) Recently she placed 7th at the PING Heather Farr Classic and earned runner-up honors in the ANA Junior Inspiration. With a victory, Menne would become the second Arizona player in tournament history to win behind Philip Francis in 2006. 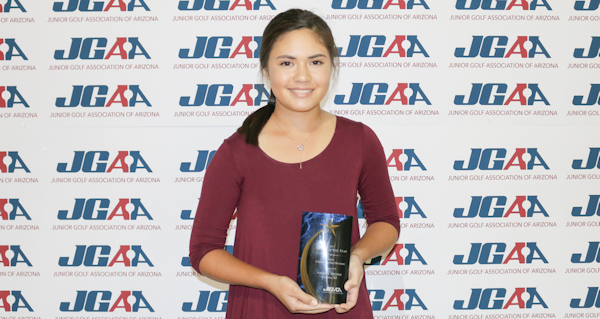 Locally at Junior Golf Association of Arizona (JGAA) tournaments Menne has racked up an unprecedented number of wins: 15 in 21 events played in 2017, and two of five events in 2018 so far. She also has been named JGAA Player of the Year since 2013 in three different age divisions, and she participated in U.S. Girl’s Junior in ’16 and ’17 as well as the U.S. Women’s Four Ball in ’16. Menne is ranked No. 1 in Arizona and 37th nationally according to Junior Golf Scoreboard. Launched through a partnership between the Phil and Amy Mickelson Charitable Fund and The Thunderbirds, the tournament has grown into one of the most prestigious junior golf tournaments in the world. Interestingly, the genesis of the event happened when co-chairs Mike Kennedy and Del Cochran were playing a pro-am with Mickelson during the Phoenix Open. Both Kennedy and Cochran are Thunderbirds, the charitable organization that runs both events, and Cochran is The Captain of the Club at Grayhawk as well. View this video to get the whole story in Kennedy’s own words. The tournament will be played Saturday-Monday, Memorial Day weekend, with tee times each day at 7 a.m. An awards luncheon recognizing the champions will be held after the final round on Memorial Day. For real-time scores, visit the TaylorMade-adidas Golf Live Scoring.